Thank you for visiting our homepage. We want to welcome you to our congregation. Everyone is welcome to participate in our Sunday service as well as our special events, such as our Christmas service. If you have any questions, please do not hesitate to contact us. We are open from 9:00 a.m. to 5:00 p.m. every day except Mondays and holidays. Baptist missionaries first started their work in Nagasaki in 1896. Nagasaki Baptist Church was founded in 1902 in order to serve God and people. In 1926 the chapel was built in Katsuyama-machi. In 1953, Nagasaki Baptist Church and Hiroshima Church received funds from the U.S. Southern Baptist Convention. These funds allowed us to build a new church in Katafuchi-machi, where we are currently located. Our education hall was completed in 1994 and new main hall in 2014 after been used for nearly 60 years. We offer various programs for people living in the local community, including a pre-school program (Hikarinoshono kindergarten), Sunday school for all ages, a wide variety of activities, parenting support, regular choir, gospel choir, Korean classes etc. We desire above all to reach out and support people of every age, in every walk of life and walk together hand in hand. 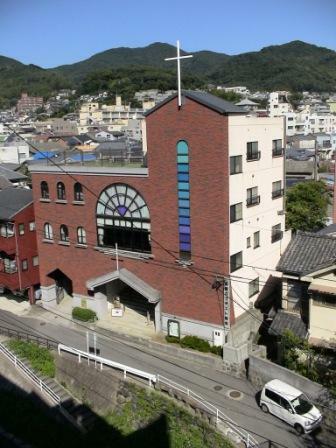 Nagasaki Baptist Church belongs to Japan Baptist Convention (JBC), which has about 330 churches nationwide. JBC was originally founded in 1947 to facilitate collaboration among Japan’s Baptist churches. In addition to its original mission, the JBC has also fully committed to serve the needs of local communities through education and medicine. Academic institutions founded by the JBC include Seinan Gakuin and Seinan Jo Gakuin. 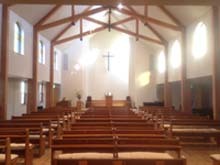 The JBC has also opened Japan Baptist Hospital in Kyoto.